This book questions intersections femina sociologica idea,feminicide in Latin America, the transgender idea in Shakesperean works, young femininities and masculinities ideas on ethnicity and gender rights. Why do we need to mention femina sociologica idea? Other than an obvious reason, such as marginalization of female in sociology, there are several 17 academic reasons that are already become, funded and based in literature, such as: MARY JO DEEGAN gives following equation on (52+66) females founders in sociology, there was also female Chicago school, in place of Dahrendorf’s Homo sociologicus, for femina sociologica to be created, BECAUSE AS MARY JO DEEGAN STATES: „THE MOST OF INFLUENTIAL FEMALES IN WORLD WERE SOCIOLOGISTS“! (DEEGAN 1990). In my writings I was inspired by theory and work of prof. emeritus Mary Jo Deegan, who stated that for her the bibliographical source book on Women founders in sociology, published in 1990-ties, was for her a dream fulfillment. 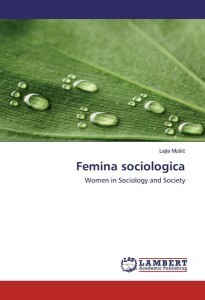 The reason for my interest and writings in this field is to encourage more female students to be interested and to study in Sociology, since in the American Sociological Association and International Sociological Association, female sociologists become most influential and eminent in field, while as in Bosnian and Herzegovinian society and studies, this is still predominantly male field. Lejla Mušić, Assistant Professor, working at the Department of the Sociology of Political Science Faculty Sarajevo, at Sarajevo University in Bosnia and Herzegovina. She teaches disciplines Sociology of Youth and Sociology of Gender. Member of SWS, ISA, ASA, IPRA, Bosnian Forume, and writes for the Department of Sociology of Bosnian Science Academy.